There’s a great story about LBJ in 1948, fifteen years before he would occupy the White House. 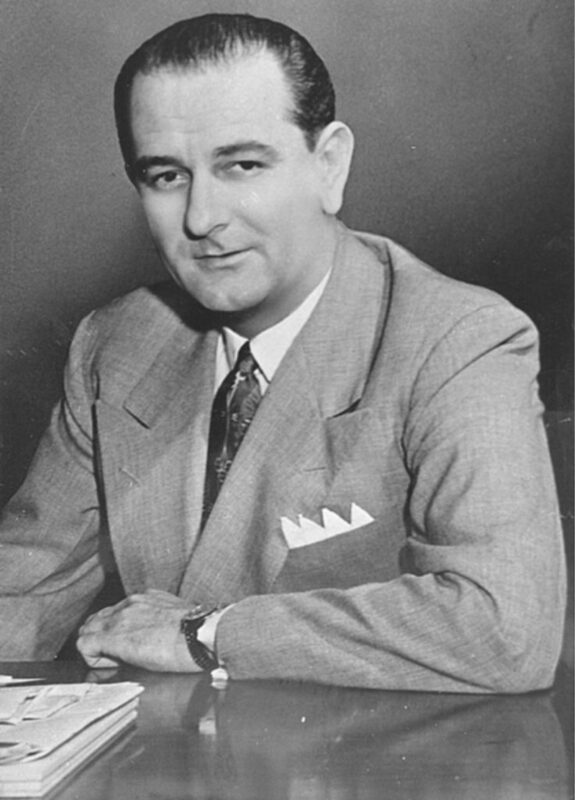 At the time, he was just a Democratic Senator from Texas, his first year on the job, when he received a call from President Truman. Truman wanted to speak with him about his views on selling military defense plants to private industries, which Johnson opposed. The meeting was to happen the next day, and Johnson was so excited about it, he went out and got gussied up. After all, he had only been to the White House a few times before this. And he was going to meet the President. That day, LBJ went on a Pretty Woman shopping spree. He got a haircut; he had his nails manicured. He bought a brand new pair of shoes and hurried over to Lewis & Thomas Saltz, one of Washington’s most prestigious clothiers. In what was an early version of buying a bunch of stuff from Mr. Porter and returning most of it, Johnson picked up a boxful of white shirts and a dozen “presidential” neckties. He wasn’t going to keep all of them — he just wanted to try them on back at his office, with the help of his stylish, young staffer Warren Woodward, to see which combination would be best. Then, that night, he turned to the folding of his white pocket square. One of his former staffers, Horace Busby, recalls how Johnson was adamant about having all four points showing (“none of this just a few points for him,” he said) and the square perfectly aligned with the top of his outbreast pocket. “So he spent part of that evening at his desk, folding and refolding the handkerchief, and cursing it when it didn’t come out right.” Robert Caro covers the incident in his book, Means of Ascent (The Years of Lyndon Johnson). Johnson got one thing right: a pocket square is the easiest way to improve the look of a tailored outfit. You should have a few — a white linen square, then some in silk or wool to coordinate with different jacket, shirt, and tie combinations (a white linen square can sometimes look a bit sterile). I also like having a few wispy cottons for summer. If it’s a white linen square, you can use what’s known as the Presidential fold (sometimes called a square or TV fold). You know how to do this, but if not, there are online guides. 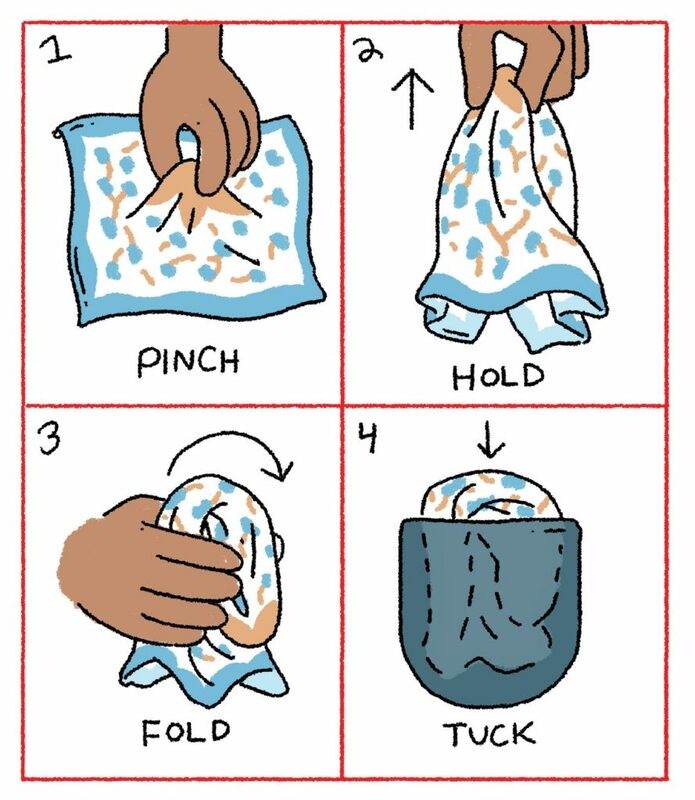 Basically fold it so a small, quarter inch of fabric peeks out from the top of your pocket. This is the default for more formal or serious occasions, assuming you feel a pocket square would be appropriate. The other way I picked up from one of my favorite style blogs, Tweed in the City (now unfortunately defunct). Here, you pick up a square by its center, then simply fold it over on itself. This creates a curve, which you tamp down into your pocket with the points facing down. It’s simple, tasteful, and fast. The pocket square never looks like’s exploding out your pocket. It doesn’t look like some kind of origami project. And best of all, it does what it’s supposed to do — add a bit of visual interest while seeming insouciant. See above for the how the square should look in the end; below for instructions. 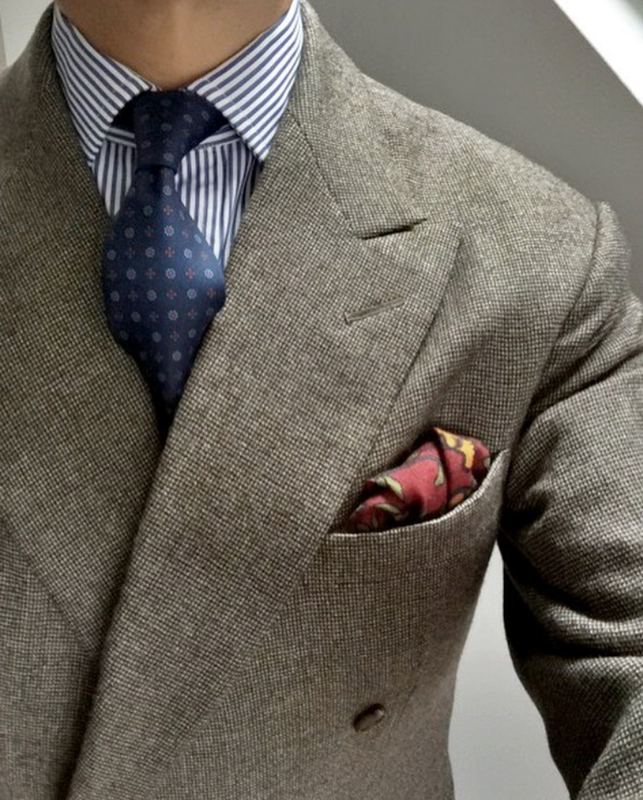 There are other ways you can wear a pocket square, but none are as easy or failsafe. If your square has multiple colors in it, you can twist it around so it coordinates with the rest of your outfit. But the colors should complement your shirt, jacket, and tie — never directly match (e.g. a spot of brown to pick up a color in your jacket; a red square to complement your blue tie). Like the fold itself, the effect should look like you threw the accessory into your pocket without fussing over it. Oh, and for more stories about President LBJ and his wardrobe, check out this legendary phone call, where he orders six pairs of trousers from his tailor.